The Textiles tent is a calm yet busy space inside a lovely, white canvas marquee. Julie and Sally will be providing support, advice and sewing skills to upcycle textiles and fabric throughout Radical Bakers, concentrating on what you need for low impact living. Come along to the Friday evening project chat session to discuss ideas for up cycling textiles, designing things for living in small spaces, (boats / vans etc) and items you may like to make during Saturday and Sunday morning sessions in the textile tent. Also in the Textiles tent, Stella Berg will be demonstrating Dyeing and Spinning as well as giving a talk on Textile Sovereignty, Cat will be running a Knitting session, . This is just one stream of workshops at Radical Bakers, have a look at the Workshops page. 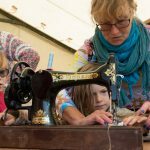 Julie Henderson is now a canal based ‘roving trader’, up cycling textiles and unwanted items into new and useful products as Lily Limpet Treasures and delivers ‘Learn to Sew’ sessions for community education groups in and around the Fens & East Midlands. She is currently converting a 21’ butty narrowboat into a floating workshop to expand her making space after retiring from a life in social care and business support consultancy. Sally Redman-Davies brings her great creativity and experience as a vintage style dressmaker seamstress to our sessions. Her current day job is promoting her passion for sustainable transport as Rutland’s Sustainable Transport Officer. Sally and Julie have delivered various workshops and groups together for almost 30 years. 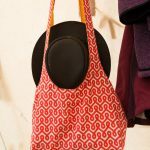 With their combination of design, art, construction skills and a shared passion for up cycling and for all things low impact, zero waste, our textile sessions promise to give you a great opportunity this year to get those textile projects resolved or moving, or just come along and make something useful such as hanging pockets, hobo bags or wherever your imagination goes. Materials and machines available at the sessions, or bring along your own.